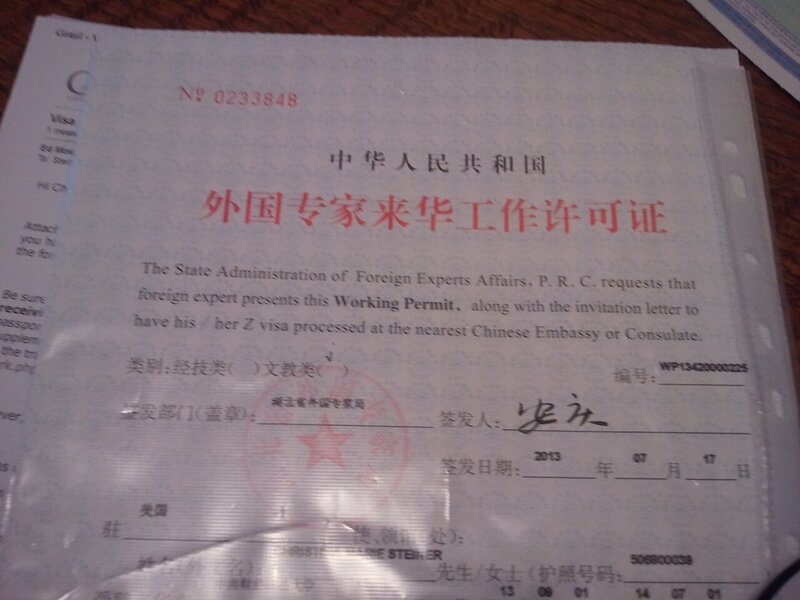 Today I received my official Working Permit form the State Administration of Foreign Experts Affairs, and Invitation letter which is part of the packet I will be sending off to get my work Visa. I’ll be sending these off Monday to the Chinese consulate in Chicago along with my original passport, visa application, recent photo, and proof of residency. Also this afternoon I’ve been writing Thank-You notes to some of my supporters who have sent checks and provided the financial means for me to be able to go to China. I’d love to list everyone by name that has been so gracious in helping me, but the list would be very long. It is sufficient to say, I am very blessed. I was looking back through my prayer journal, and it was only a few short months ago, in April that I even thought about going to China. When I sent out the first batch of letters, 75 or so to nearby churches, I only got a response back from two of them. One Wednesday night I was talking to a couple friends at church, and one of them told me that maybe I waited too long to make up my mind and that I should wait until 2014 to go. Another friend told me that if God wanted me to go to China that he would provide the financial means for me to go. “Now I’m not saying that you don’t have to do your part, you’re still going to have to do support raising, just know that the money is there, you just haven’t found it yet”. At this point I’d only raised a fraction of what I needed for my plane ticket alone, and it was April. I had two months to raise the additional funds. I was in panic mode. “I can’t do this”, I thought. “This is too big”, and you know what, it was too big for me to do on my own. It wasn’t too big for God though. So I sent out more letters, to all my friends and family (probably to most of you that are reading this right now), and everyone has generously given from their hearts. So I am counting my blessings, and saying thank you to God because he is the reason I’m going to China next month.